Why have I not discovered these easy freezer breakfast sandwiches until now? I feel like I’ve been left out of one of the world’s best kept secrets. These protein-packed, homemade, grab-and-go sandwiches are one of the easiest and most delicious things in the world! The other day I had some leftover scrambled eggs so I did a little experiment. I sandwiched them between a sliced English muffin along with some ham and cheese, wrapped it up and froze it. I wasn’t sure how it would reheat. Would the eggs be rubbery? Would the muffin be too dry? Would it be a total disappointment? The next morning at work, I warmed it up in the microwave and it seriously rivaled any breakfast sandwich from any fast food joint. Plus, it was a fraction of the price you would pay for a fast food breakfast sandwich. And one of the best things about them..I was able to re-purpose the leftover scrambled eggs from the day before! No wasted food! Woop woop! Yesterday, my mom and I had a jam-packed day of freezer meal prepping – a full eight hours of cooking and baking (more on this another time). Considering my new-found love of freezer breakfast sandwiches, they were definitely on our list to make for our freezer stash. 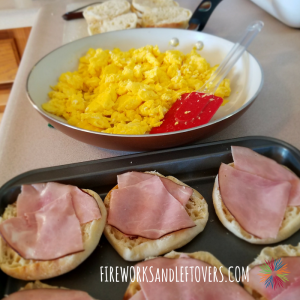 For these sandwiches, you could bake your eggs in the oven in a muffin tin or fry them on a griddle using egg rings but we made scrambled eggs in my mom’s Tramontina ceramic fry pan. Let me tell ya, every bit of egg ended up in those sandwiches because none of it stuck to the bottom of that ceramic pan! I have a crush on that skillet! I also prefer the texture of fluffy scrambled eggs vs. eggs baked in the oven. I’m also not a fan of egg yolk and scrambling them prevents you from biting into a mouthful of just yolk. Yuck! 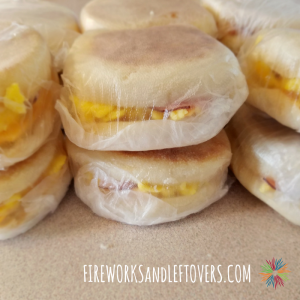 Another great thing about these breakfast sandwiches is they come together in a snap! We made a dozen sandwiches in about 30 minutes which make them perfect for meal prep on the weekend or for a day full of freezer meal cooking. 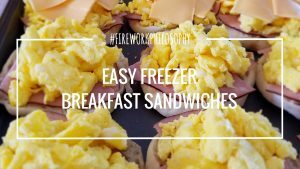 I hope you enjoy these homemade freezer breakfast sandwiches as much as I do and I hope they fuel and simplify your weekday mornings! 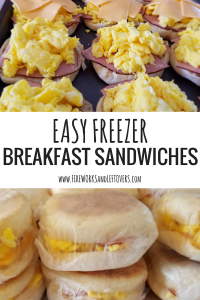 These easy, homemade freezer breakfast sandwiches are perfect for grab-and-go weekday breakfasts. Heat a ceramic or non-stick skillet on medium heat. Crack the eggs into a bowl and whisk. Add eggs to skillet and use a spatula to stir and cook the eggs through. Cool slightly. Split each English muffin and lay them out on a baking sheet. Pat the deli ham dry and cut each slice into quarters so each piece fits on an English muffin half without much overhang. Add the wrapped sandwiches to freezer bags labeled with reheating instructions. REHEATING INSTRUCTIONS: Remove plastic wrap. Wrap in paper towel. Microwave for 1 minute. Flip and microwave for 30-45 seconds or until warmed through. TIP: Add cooked bacon slices to the sandwiches along with or in place of the ham. TIP: Add onion powder, garlic powder, black pepper and/or sliced green onion when you're cooking the scrambled eggs for an extra punch of flavor.